The Human Illusion - Devotion to Christ, as Savior and as Lord, is drawn from deep human need. Where such need is lacking, the Redeemer is but an answer to problems which are nonexistant and irrelevant and meaningless to life situations as glasses for those born blind. sin is the deliberate disobedience of God. sin is revolt against God. sin separates the "creature" from the creator. sin creates a fourfold enmity between God, self, others, and nature. sin leaves humankind carrying the burden of guilt and in the grips of a "sense of guilt." sin leads to spiritual, temporal, and eternal death. His works have made the sinful "holy and blameless and irreproachable" before God, "canceled the bond which stood against us with its legal demands", and "made purification for sins". He has "died for the ungodly", "bore our sins" on a tree, saved us from God's wrath over sin, expiated our guilt, and washed us clean in his redeeming blood. "There is therfore now no condemnation for those who are in Christ Jesus." The barrier between humankind and its Maker is broken, and Creator and creature are reconciled. Jesus Saves From Sin As Separation - Self-Imposed - Earlier studies stated that the "sense of guilt" of Adam and Eve drove them away from God. This has always been a separating force between the Creator and the creature. We are reluctant to come before the Creator with the sordid news of our disobedience; and a dividing wall, which is of our own making, is fashioned between our Maker and ourselves. Jesus Saves From Guilt and a Sense of Guilt - And then, when we hear the words: "Your sins are forgiven." God loves us yet! He cares for us in spite of our failures and welcomes us back into his eternal arms just as we are! It is the everlasting good news of the ages that God's love is greater than our rebellion. With "sense of guilt" gone, the dividing wall between Creator and creature is shattered; and people and their Maker are reconciled. Jesus Saves From the Threat and Power of Evil - Jesus as Savior came not only to save his own from the guilt of sin, but he came also to break sin's power in their lives. The forces of darkness may have held the estranged in their grip, but they shall win no everlasting victory over the redeemed. For the Savior empowers his own to walk the path on which he walked. Jesus Saves From Spiritual Death - The reconciled, who have but tasted the fruits of a new relationship, are sensitized by Christ to their urgent needs for communion with God. Hence, the redeemed spend time in worship, in prayer, in praise, and in meditation. In each of these ventures, the "whole person" is fed; and life is appropriated in its fullest degree. Jesus who has broken down the dividing wall between the Creator and the "created", has made possible a close communion between Father and children. The Savior opened the way back to the source of life and so raised people from spiritual death to spiritual life. Spiritual Death Issues in Temporal Death - The reconciled do not just exist on this earth, they live! It is not so with the estranged. They die even before they reach the granite stone. Life, in the present time for them, is a mockery of what it is meant to be. For spiritual death issues in temporal death. Mortals, apart from the Creator-God, see life as it was designed to be, passing them by. The Cosmic Dimensions of God's Saving Love - It is true that the redemptive news was aimed primarily at the covenant community, extant at Christ's coming and to individual members within that community, yet, salvation from the Hebrew vantage point also entailed God acting in the Historical process to save and redeem his whole creation and to restore that creation to the intent which he had for it at the beginning of time. Great Waterfall - The human predicament. Broken Boats - Humankind's devices to save itself prove hopelessly inadequate. Person clinging to cross - God's saving act in Christ deals directly and effectively with the human predicament. Second pointed rock at base of waterfall - He saves from guilt and from a "sense of guilt." Third pointed rock at base of waterfall - He saves from the threat and power of evil. Three graves on shore - He saves from death. 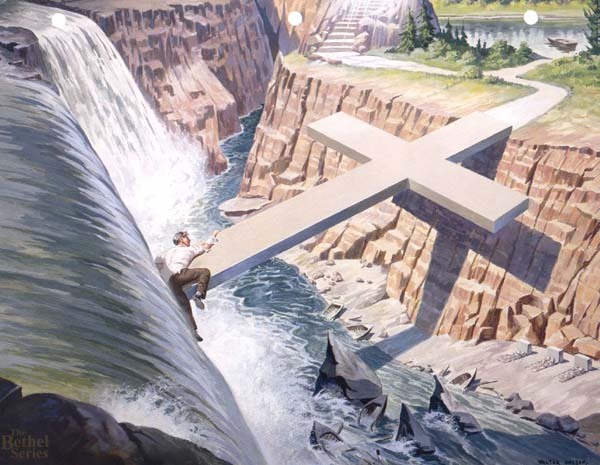 Cross spanning chasm - The cross of Christ bridges the gap between this life and the next and provides believers with a pathway to the eternal mansions. Ascending stairway - Reconciled to God, through Christ and his cross, the redeemed in him escape "the death" born of estrangement . . . and begin the appropriation of the fullness of life intended for them at the beginning of time and continuing on into eternity.